Geez, if ever a horse was well named …! In an absolute thriller, Magnus first starter, Fight To The Line, did exactly that last Friday over 1000m at Geelong, scoring by a nose after leading throughout. 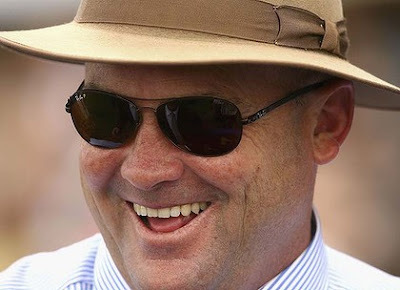 Trained by Peter Moody (below), Fight To The Line was sent out a $1.90 favourite and while the connections might have had heart flutters close to the wire, the Magnus 3YO fought back strongly. Bred and raced by John Krueger, Fight To The Line is out of the Snippets mare Delicate Snip. Interestingly, Peter Moody had an 1800m Magnus winner two days prior with Magniloquent and has a very close association with the stallion he trained to Group One victory and over $1.3 million in stakes. Indeed, he is the co-breeder of The Alfonso, a smart looking Magnus 2YO who won a Rosehill trial for Chris Waller yesterday after the leading Sydney trainer snapped up the colt at last year’s Magic Millions Horses in Training sale. Leading Sire of 3YOs by winners to runners, Magnus maintains his lead at the head of the Australian Second Season Sires’ premiership by winners.